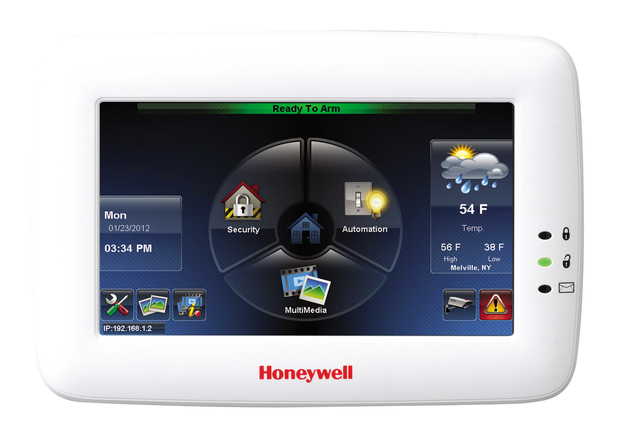 The Honeywell Lyric Alarm System and the Tuxedo Touch Keypad both represent security hardware manufactured by Honeywell. Both are devices that feature touchscreen control. However, the Lyric Controller is an actual alarm control panel, while the Tuxedo Touch is just a touchscreen keypad. In terms of functions and controls, it's actually easy to see how the Lyric and the Tuxedo Touch are pretty similar. Both are touchscreen devices that can be used to arm and disarm a security system. They can also both be used to activate Z-Wave smart home devices and trigger smart scenes. Both can sync with Total Connect 2.0 and share information with the service. Both can be used to program a system, albeit in different ways. Both display a weather forecast from the main screen. But upon closer look, you will actually see that the Lyric Controller and the Tuxedo Touch are two completely different devices. More precisely, the Lyric is a system, while the Tuxedo is a keypad. The Lyric represents the central hub for a security system. Various sensors are assigned system zones, and they report to the Lyric when activated. The Lyric can support up to 128 wireless zones. The Tuxedo is not a system, and sensors do not report to it. It does not have any zones. Although a Tuxedo can control a system, the sensors will actually report to the system itself. The Tuxedo Touch is a keypad that is used for controlling a security system. Namely, it is used with a hardwired Honeywell VISTA System. The advantage to adding a Tuxedo Touch is that it will allow the system to support Z-Wave devices, and it will serve as a convenient touchscreen controller for the system. Meanwhile, the Lyric is an actual security system that has its own built-in controller. As a security system, it cannot be used with other systems. This is not the case for a Tuxedo Touch, which as a keypad, must be used with a security system. 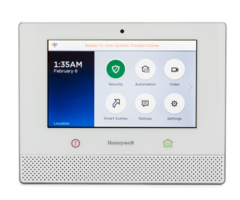 If you have a Honeywell VISTA System, and you want to add an additional on-site point of access, you might consider adding a Tuxedo Touch Keypad. But if you have a Honeywell Lyric Controller, you will not be able to add a second Lyric Controller to gain an additional point of access. You cannot pair a Lyric Controller with another Lyric Controller. However, you can add a Honeywell LKP500 Keypad to serve as a secondary access point for a Lyric. Also note that the Tuxedo Touch is technically a hardwired keypad. It cannot be used to operate a Lyric Controller, as the Lyric does not support wired keypads. And due to the nature of the Tuxedo, it can only be used with compatible systems, which include those from the Honeywell VISTA Series. Keep in mind that the Tuxedo Touch is an advanced user interface (AUI) device, and a VISTA System is only capable of supporting a limited number of AUI devices. Remember, the Total Connect 2.0 service also counts as an AUI device!